The small train travels the streets of Avignon in Vaucluse, Avignon in France, Europe. 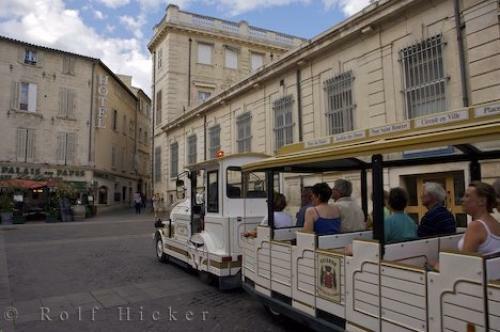 Photo of the Small Train touring Avignon in Vaucluse, Provence in France, Europe. ... Tourist Information, Place St Didier, where the Church of St Didier stands and Place St Pierre, where the beautiful Eglise St Pierre can be seen, are the final stops. From Place St Pierre the Small Train of Avignon in Vaucluse returns to the Palais des Papes, and for just a few Euros visitors have seen much of Avignon's history.Train Tour through the walled medieval city of Avignon, Vaucluse, Provence, France, Europe.